In recognition of our veterans and the sacrifices they have made in service to our country, Growth Energy salutes the men and women of the United States armed forces. 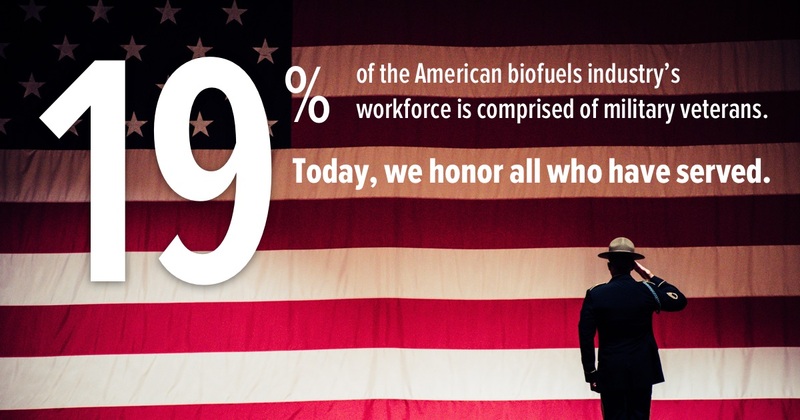 We are proud that 19 percent of the ethanol industry’s workforce is comprised of military veterans, and the entire industry takes pride in producing homegrown biofuels. In observance of Veterans Day, we would like to thank all of the brave men and women of the U.S. Armed Forces who protect our freedoms, values, and rights. To show our gratitude, Growth Energy has made veterans a core part of our American Ethanol racing program. We host veterans and active duty servicemembers from our member companies and their families at Daytona International Speedway over the Independence Day weekend. This weekend was part of NASCAR Salutes, a portion of season devoted to honoring the U.S. military. As in the biofuels industry, the spirit of patriotism runs deeply throughout NASCAR, and hosting vets and their families at the track is one small way that we can say thank you to all who have served. We encourage you to watch this year’s Daytona Veterans video below to learn more about this salute to those who selflessly serve and protect our great nation.